A middle-aged woman presents to the emergency department complaining of decreased vision and an aching pain in her right eye. She says it came on after an argument with her husband earlier in the evening. The eye pain has progressed to a frontal headache. She could hardly read anything on a Snellen’s chart, and while you were assessing her visual acuity she started to vomit. This is new onset raised intraocular pressure resulting from failure of the trabecular drainage system. It causes loss of vision by compression of the optic disc. Aqueous humour is produced by the ciliary bodies in the posterior segment. It circulates forwards into the anterior chamber (AC). It is resorbed through the trabecularmeshwork into the canal of Schlemm which drains into episcleralveins. The aqueous humour provides structural integrity to the eye,provides oxygen and nutrients to avascular structures like the lens and the cornea, and disperses waste products. Q2. What are the possible underlying causes of this condition? Acute angle closure glaucoma can be primary or secondary. 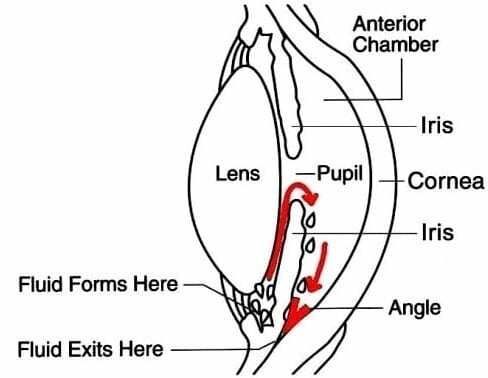 Pupillary block — this occurs when the posterior iris contacts the lens, blocking the flow of aqueous humour from the posterior chamber to the anterior chamber. The resulting increase in posterior chamber pressure pushes the iris forward and blocks the trabecular meshwork. Angle crowding — this may occur due to an abnormally configured iris, e.g. plateau iris, that obstructs the angle during pupillary dilatation. Q3. What are the risk factors for the primary form of this condition? Q4. What are the possible precipitating factors in the primary form of this condition? Q5. What features on history and examination should be looked for? Slit lamp — shallow AC (closed angle), injected conjunctiva; corneal microcystic edema. Consider secondary causes, e.g. synechiae, neovascularisation. Tonometry — high intraocular pressure (IOP). The eye is tense and tender on palpation. Note that angle-closure glaucoma can occur in the absence of high IOP. Fundoscopy — pronounced cupping or spontaneous arterial pulsations signifies the need for urgent treatment. Rule out CRVO and hemorrhage. 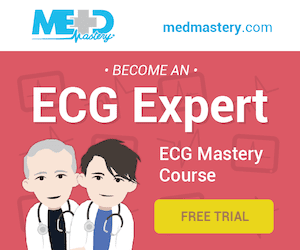 If the patient presents very early in the attack, there may be very few examination findings. Q6. What is the management? Urgent ophthalmology referral — severe and permanent damage may occur within hours. topical cholinergic (miotic) — e.g pilocarpine 2 or 4 % eyedrops — one-two drops q15min until pupillary constriction occurs (a 2% solution may be better in blue-eyed patients and a 4% solution in brown-eyed patients); especially if angle crowding is suspected. topical alpha2-agonist — e.g., apraclonidine 1% 1-2 drops as a single dose. Q7. How is open angle glaucoma different from this condition? Open angle glaucoma is a leading cause of blindness in the developed world. It is a chronic condition, usually affecting both eyes and typically occurs in the elderly. progressive cupping of the optic disc. Treatment is with topical agents (similar to those used for acute closed angle glaucoma) and surgery. Q8. What is a normal intraocular pressure? Patients with intraocular pressures higher than this should be followed up by an ophthalmologist. Q9. Why is visual acuity more important in the assessment of this condition than tonometry? Glaucoma is really best viewed as a type of optic neuropathy. Patients vary in their susceptibility to intra-ocular pressure changes. 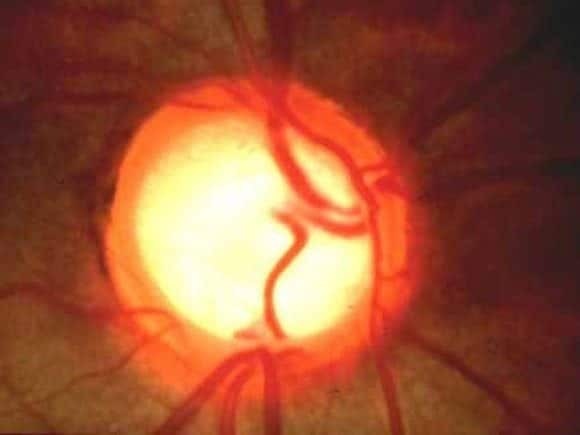 Glaucoma can occur at ‘normal’ intraocular pressures, and other patients appear unaffected by chronic intraocular hypertension. Q10. What is shown above? 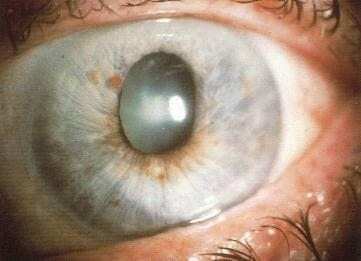 A pale, cupped optic disc — the hallmark of chronic glaucoma. 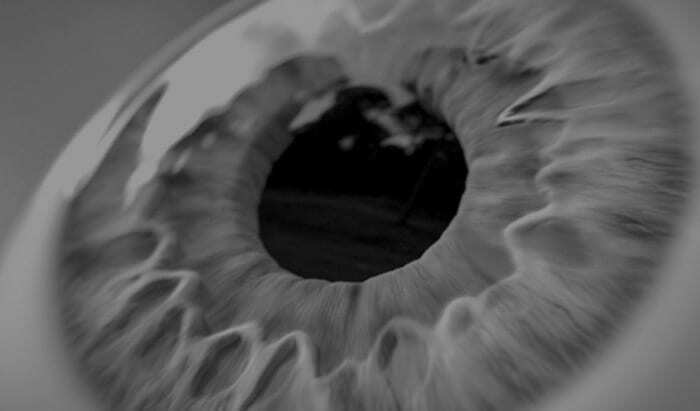 A sustained rise in intraocular pressure causes ‘atrophy’ of optic nerve fibers. This occurs centrally causing an enlargement of the central cup of the optic nerve. The normal cup-to-disk ratio is 0.3. A cup-to-disk ratio >0.6 is characteristic of chronic glaucoma.